This soup is incredibly simple to make! But the final product still delivers in richness and depth of flavor. Season beef with salt and pepper. Then, using sauté setting – once hot add 2 tablespoons of oil and thoroughly brown beef. Do this in two batches and do not stir too frequently. After the first batch, add 1 tablespoon of oil. Do not wipe or rinse bottom of pot! There’s so much flavor in there! Continuing on sauté setting – add onions, carrots, garlic, celery, mushrooms, thyme, Worcestershire sauce, and bay leaves. Cook for about 5 minutes, stirring frequently, making sure to scrape up any bits on bottom. 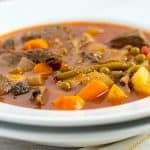 Then, return beef to pot and add all remaining ingredients (you can really add whatever vegetables you prefer) and mix well. Lock lid and cook for 10 minutes at high pressure. Once cook time is complete, allow pressure to release naturally (will take about 25 minutes). Remove thyme bundle and bay leaves. Serve and enjoy!